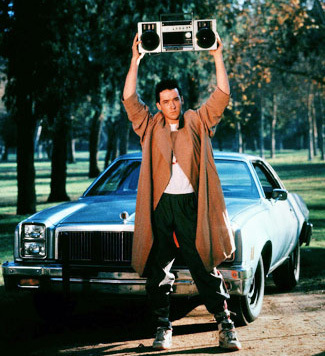 When Meaghan announced the theme of her New Year's Two party was "80s Icons" I knew who I wanted to be: Lloyd Dobler, the boombox-toting misfit boyfriend from 1989's Say Anything. 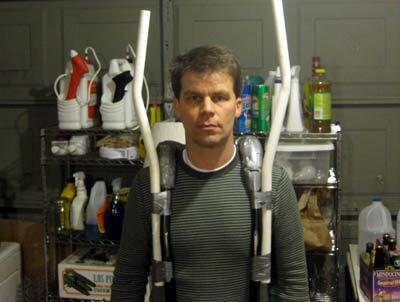 I already had a shoulder harness bent from PVC (plastic) pipe (reused from the Geico money costume). 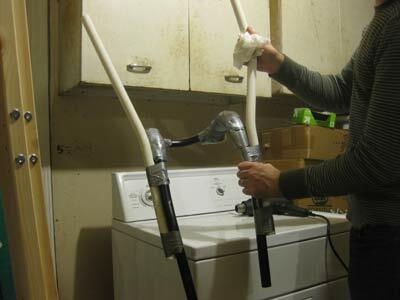 For arms, I added two 30" PVC uprights. They needed a little bend to them, so I threatened them with a heat gun for about 45 seconds and bent in some slight elbows. Normally I would screw these uprights to the shoulder harness, but I used duct tape here for temporary placement. Finding the perfect boombox was going to take more time and money than I had, so I checked local thrift stores. The fifth store had one which was not terrible for $3. I also picked up a beige trench coat for $7. 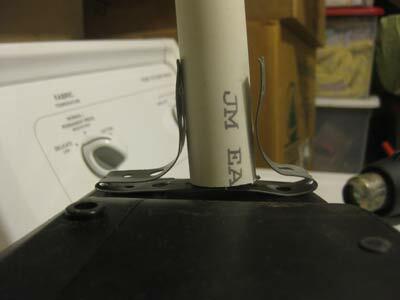 I used two bent pieces of plumber's tape (flexible steel strap) to screw the pvc arms securely to the plastic bottom of the boombox. 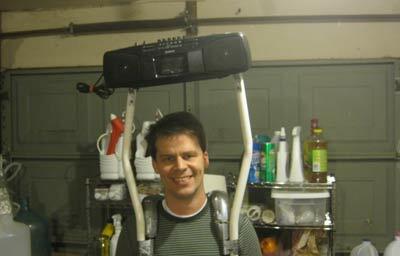 This strap shape was not ideal, because as the strap weakened under use, it allowed the boom box to flop forward and backward a bit. You'll notice that the hands aren't in this arrangement yet. I figured it would be easier to attach the pipes to the box than to attach the pipes to the hands and then the hands to the box. 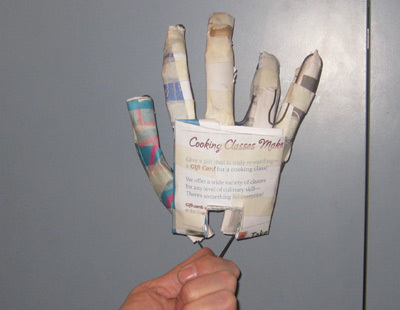 I planned to make the hands out of wire and newspaper, so they wouldn't be a good addition to the actual support structure. Boombox attached. This is already looking like a win! This photo should give you a glimpse back in time to how people used to carry their tunes with before Apple invented the Walkman. Next up, it was time to make hands. 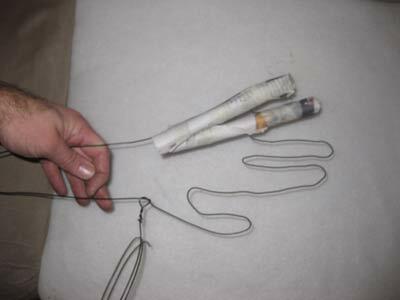 I started with steel wire, available in the concrete and cement block section of Home Depot. I bent up a crude hand-shaped outline. 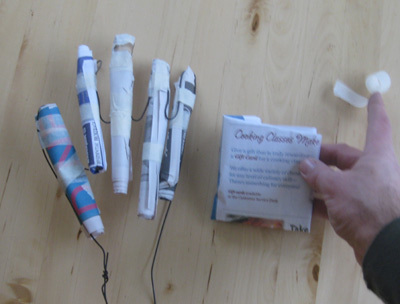 To create thick fingers, I rolled up newspaper into long sausages and taped them into place with masking tape. The thumb is slightly bigger than the others, for amazing life-like realism! Let me show you the back of my hand, it's this little square of paper. 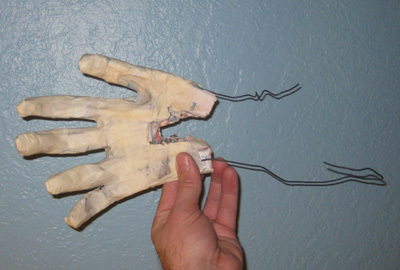 I wrapped the whole hand in masking tape to smooth over rough edges. The hole in the palm is to allow the PVC uprights through. The surface of the hands was obviously masking tape and the color was completely wrong, but I had two hands. I didn't have any quick way to create a realistic skin, so I took the shortcut and slipped on some thin fabric gloves. I used two lengths of styrofoam fun noodle (green in the photo) to add a little girth to the forearms, and threaded the whole thing through the arms of the trench coat.
. To keep the coat sleeves properly suspended, I used pins. All done! 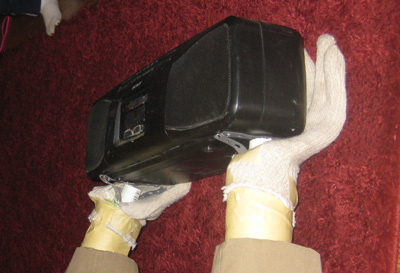 The fake arms kept the boombox aloft, and I kept my arms inside the coat. The costume was a hit. 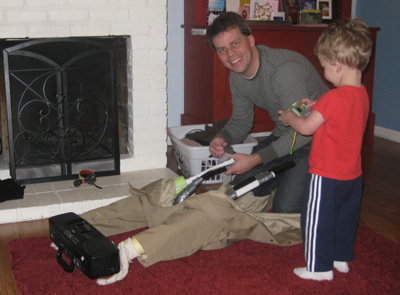 It was comparatively lightweight and comfortable. Tthe party was a success! The radio worked, but tragically the tape player was more interested in chewing tape than playing it. 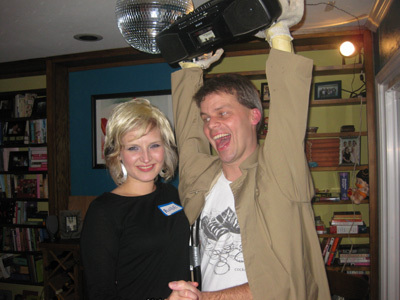 However, being an 80's party, there was plenty of Peter Gabriel being played, so it worked out well. 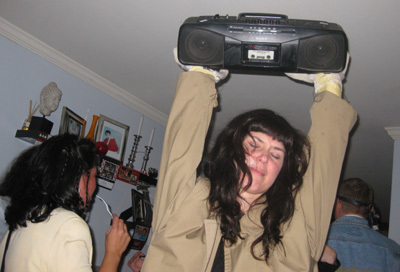 Meaghan's house had ceilings which were tall enough to handle the elevated boombox. At one point I rushed outside to serenade the party through Meaghan's living room picture window. One by one the guests inside turned to notice my emotionless face worming its way into their hearts. Huge laughs. Other guests had one complaint, and knowing the secret of the costume didn't dispel the illusion: Seeing me with my arms up all night made their arms hurt! I also encouraged a few other people to try bearing the arms. I strongly recommend trying a costume of this sort. 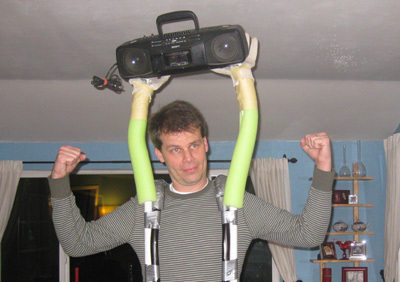 Whether it be a "high-fives" costume or a weightlifting olympian, extra arms = extra fun. 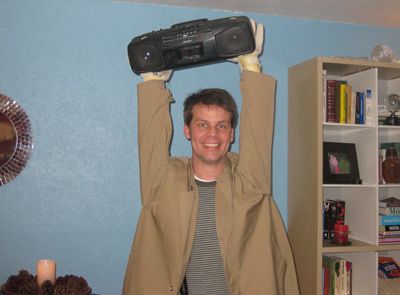 Matthew Baldwin's Lloyd Dobler Costume. Home | Contact Rob January 24, 2010.